Hello, and welcome to my house of glass…please enter at your own risk. Ha! I’m pretty sure Emma nor I would be allowed to visit let alone live in one of those. I am so clumsy that it’s ridiculous-remember the movie Pure Luck? That’s me. I even walk into walls and doorways that come out of nowhere. Crazy I tell ya! 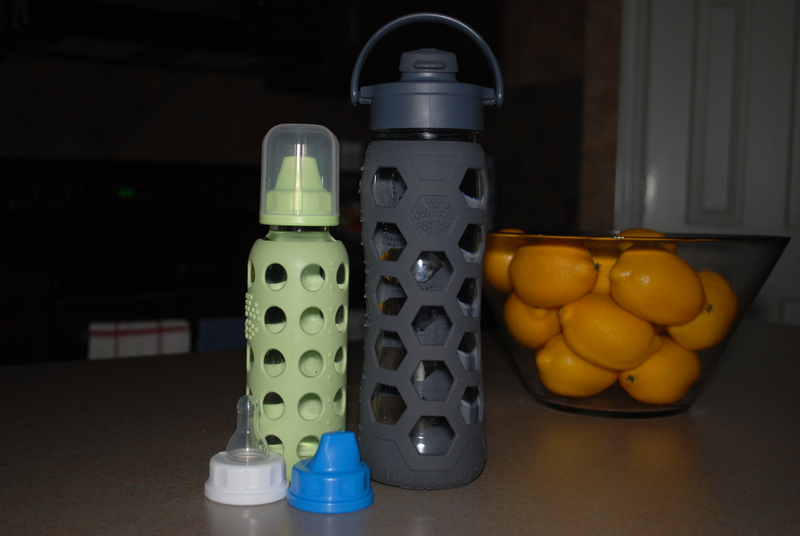 The point of this post is to let you know about a different kind of water bottle for baby and mama/daddy alike. I had seen them while shopping in Whole Paycheck Foods but was holding out because they were a little pricey…until a few months ago. Since I am a water carrying fool and can’t leave home without it, it was definitely time for an upgrade. In case I forget, Emma will say ‘Mommy bring wawa (water)’ when we head out to go run some errands. Love that kid. I decided since I was doing glass for me, baby girl should do the same. Emma is clearly passed the bottle stage, and since I’ve been home with her and she nursed for 18 months, bottles were non-existent after about 6 months. BUT they do have the option to turn the 9-ounce bottle into a sippy cup of sorts, which is cool. It’s almost like all you need from birth to toddlerhood is the same nifty glass bottle. Sweetness. I have to say I am in love! I like the amount it holds and the sleek Carbon color…though I would have sprung for the Spring Green if it was available. They just barely came out with the Flip Top Cap when my sis and I decided to splurge on one and I haven’t been disappointed. They will run you about $24 for the 22-ounce container and $17 for the 9-ounce bottle. It’s worth it to me, and I like them because they are ‘free of BPA, phthalates, PVC, polycarbonates, lead and latex.’ Winner, winner, chicken dinner! UPDATE: They have since expanded their line! Yes, you may be leery of using glass, as I was, but we have been successful so far (at least I have after dropping it a few times). I was even surprised that mine didn’t spill out the mouthpiece when knocked over since it doesn’t seem very sturdy. Emma on the other hand has had one replacement that is still going strong. I figure since a lot of people have been switching their storage containers over to glass, this seems like a perfect way to convert your crunchy (not in a good way) plastic bottles over as well and start reducing our carbon footprint. So whatcha think? Have you ever heard of or seen these bottles before? Do you use glass now or are you too worried it will break? I may not be allowed in a house of glass but I will try to keep the nasties out of my water bottle and go commando green. 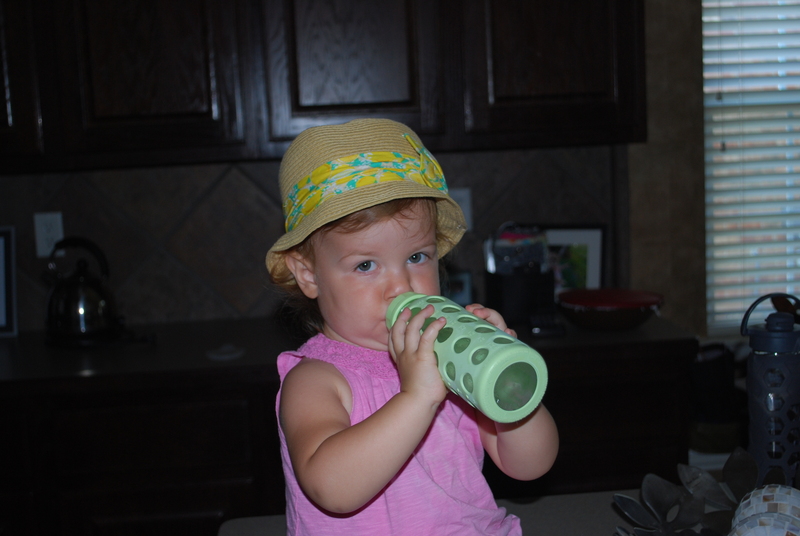 How old was your daughter when she used the sippy cup attachment? My daughter is now 17 months and currently using a plastic tupperware sports top bottle but it does leave her drink tasting plastiky so looking for glass. Am wondering whether I should get the smaller version with the sippy cap or go straight to the kids/adult version with straw or flip top….